Kalathappam is a Malabar (Indian / Kerala / Kannur) delicacy made from rice flour, jaggery sugar, fried onions and coconut flakes. Its more popular in Kannur. This snack is prepared in pressure cooker. I got this recipe from Shibin Dinesh. While I was in Kannur, he posted about this snack in facebook. Next day I purchased it from Sheen Bakery in Kannur and we all loved it. Back at home today, I prepared it following Shibin’s recipe. It all went well and let me share the exact recipe with you. Soak the raw rice in water for 1 to 1½ hour. Transfer the batter (should be grinded thoroughly) to a bowl, add baking soda and keep it aside. In a pan warm the jaggery by adding one cup water to liquid form. Turn off the flame and allow it to cool. Filter the jagerry through a sieve to the batter in the bowl, add cardamom powder and mix well. The final batter should be lighter in consistency than the Dosa batter. This determines the softness of Kalathappam. In a pan warm the batter in low flame (Do not boil but stir it thoroughly while warming) and turn off the flame. Add the batter to the cooker and gently mix with the contents and cover the lid without putting the weight of the cooker. Wait for the steam to escape and then turn the flame to minimum and cook for 20 minutes or until a toothpick inserted into the center of the Kalathappam comes out clean. Separate it from the sides of the cooker using a flat spoon and serve it hot with a cup of tea. While warming the batter do not allow to form clumps. If any clumps are formed, turn off the flame and stir well. No further warming required. You can use Basmati rice also, instead of the raw rice. It should not be kept for the next day. You should finish it the preparation day itself. 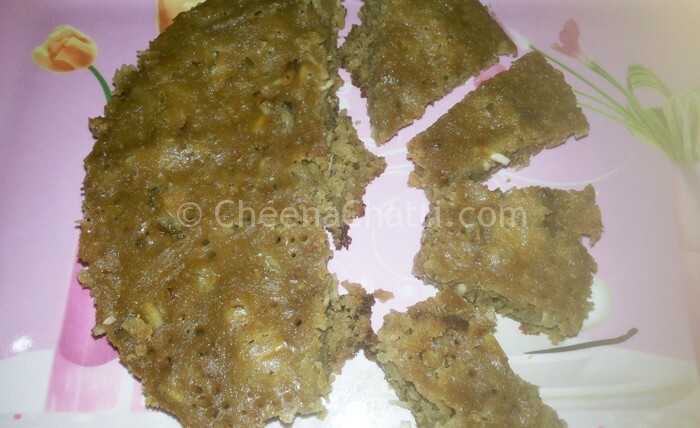 This entry was added on June 9th, 2013 by Jameela Beevi in Bakery and tagged with best kalathappam recipe, tasty kalathappam, how to make kalathappam, nadan snacks, kannur kalathappam recipe, kalathappam recipe, easy kalathappam, kerala snacks, good kalathappam recipe. Last revised on April 4th, 2018. Great!!!! And thanks for the English Version!! Some of my Non-Kerailite friends has been asking me for the English version of Kalthappam! Now they will be happy seeing this! Anyways, great to hear the dish came out well!! @Shibin Dinesh : thanks for stopping by and encouraging me. The full credit goes to your wonderful explanation. @Kelvin: Thank you for the prayers. We need your support and prayers through out this venture. @Divya: try it and let me know your comments. Hope it will come out well for you..
DEAR JAMEELA, THANK U FOR THE SIMPLE PRESENTATION OF KALTHAPAM. MAY GOD BLESS U .
which boiled rice to use? red or white. should it be soaked or cooked? @Jayasheela Uchil : We use cooked red rice.